Here’s how to be comfortable in an uncomfortable world. The increasing pace of change can make the world increasingly uncomfortable so we need to be comfortable being uncomfortable. Look at how fast things change. When the economic recession hit in 2009, the top five constituents that represented 14% of the S&P 500 Index were Exxon, Procter & Gamble , Johnson & Johnson, AT&T and Chevron. 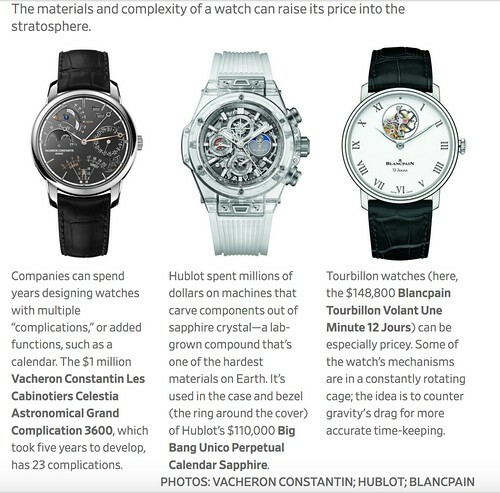 The Wall Street Journal article “Is Time Running Out for the Swiss Watch Industry?” (1) provides another example of how to face the challenge of change. With sales flagging, Switzerland’s watchmakers need to raise the interest of a generation that has no need for traditional timepieces. Executives across Switzerland’s watch industry have been wrestling with the same question. How can they convince young consumers that mechanical timepieces are relevant—let alone worth the price of a car? The article tells how the Swiss have rebranded watches again and again and says: When you feel comfortable, you are entering the danger zone. Look at some of the challenges the Swiss watch industry has faced. The first existential threat came in the 1970s was the introduction of the quartz watch. This electronic timekeeping technology is far more accurate and cheaper to produce than mechanical watches. Japanese watchmakers such as Seiko flooded the global market with inexpensive quartz timepieces, destroying the lower and middle tiers of the Swiss industry. The Swiss refocused on designing highly complicated mechanical watches. They raised prices and sold the prestige and fashion. As US and European demand faded in the late 1990s, Chinese consumers began to buy Swiss watches and China’s rapidly growing wealthy picked up the slack. In 2008, deep recessions in the West and Japan, ruined in the industry’s traditional US and European markets, but Chinese buyers kept the market buoyant. Then in 2016 China’s leader, Xi Jinping, launched a sweeping crackdown on graft. The luxury watch—a favored gift to grease the wheels of business—emerged as a target of public outrage. Increased customs inspections and fees killed the demand for Swiss watches along with other luxury goods. One Swiss watch brand, Zenith, that relied on Chinese clients for 60% of its sales, saw business fall off a cliff. This is the moral of this message… “being comfortable is dangerous”. Some Swiss watch brands have hired models, performers such as Jay-Z and various street artists in their early 20s as “brand ambassadors. They are advertising in the virtual world of videogames and developed the Swiss industry’s first smartwatch. TAG Heuer developed its own smartwatch using Android as the operating system and Intel for the electronics. The Swatch Group AG designed a smartwatch that uses the Swiss industry’s legendary self-reliance. They do not depend on global supply chains controlled by big tech companies and are not reproducing something that a mobile phone can do. Swatch has its own operating system and electronics that can go a month or more without charging and won’t become quickly obsolete. The real basis of comfort, happiness, contentment, satisfaction, well-being and abundance is to be comfortable being uncomfortable. This however does not mean that we should be at unease or have dis-ease. We should gain comfort by embracing change. Always look for new ways to be of value and serve. Be uncomfortable that the sun might not always shine where you are now. Take comfort in the fact that the sun always shines somewhere and find joy in the never ending journey to find that place… where the sun shines. Most investors traditionally run from bad times! This fact creates value investing opportunity. Our motto for decades has been the sun always shines somewhere. That has helped us spot special opportunities (that worked for us), again and again. First in Hong Kong, then Switzerland, London, Naples, Florida, Isle of Man, Dominican Republic, North Carolina, Ecuador and Mt. Dora Florida. This is a repeatable process. Here are several tips that can help find your special opportunities that expand the chances of a rich amd fulfilling lifestyle. #1: Expect the next boom. Chicken Little has been around for along time yet the sky has not fallen yet. For centuries… man’s material life has improved through a series of busts and booms. We could consider busts as opportunities to gain in the next boom. #2: Never say never. Right now you may think “I’ll never come back”… or “I’ll never leave the new places where I am moving”. Perhaps not… but then again something may come up that’s even better. Do not close your mind to an even better lifestyle. #3: Don’t burn bridges. Keep your affairs in order. #4: Expand your horizons. If you move to a new place you’ll have new sights, smells, tastes, feelings and sounds. This information will reform you and as a different, more experienced person you’ll have new opportunities to serve the world in new ways. Expect to be able to have more because you can do more, because you will be more. #5: Embrace change. As a deeper, more experienced person you will see economic and social evolution in different ways and you’ll have more ways to be engaged in the change a fulfilling way… so expect this benefit. #7: Follow the Lead. This is perhaps most important of all. The Western world mindset teaches us to project how we expect the future to be and if it is not… we are disappointed. Everything really is in perfect order and we all have an important role to fill (and to be fulfilled). If we follow the steps above and are open to new ideas… new possibilities and watch for opportunity that presents itself, this process we call life gives us extra depth, excitement, beauty, wonder and abundance. All we have to do is be open, observant and obedient to our inner voice. One wise man we lived and worked with in the Andes for several years used to take us for walks in the mountains along narrow paths. As the trails narrowed… the cliffs became steep. So we would wind our way… along the cliffs… not seeing… but feeling where we were headed instead and knowing that the path was correct. Let me see if I can express in words this process that cannot really be expressed… because without want or need… following paths we could not see but knew were there, led us to happiness, fulfillment but also incredible financial success. Over 30 years ago Merri and I locked ourselves in our basement every day, for ten days. We wrote a report about financial secrets. The report sold well and generated an immediate and excellent income. Now it’s long out of date. I just have this one copy left, stored in my archives. However those ten days of effort, three decades ago, started a chain of events that creates residual income for Merri and me to this very day. Even better the ten days effort should continue to create income for us for many years more. Learn how to use brief efforts that create extra income now and continue to pay you for years… even though you don’t do a thing after the first effort. These lessons even show how to generate cash flow that lasts so long, your heirs will enjoy the income too. Learn how to do a little work for a lot of income, that comes in, again and again. See nine secrets below on how a small independent at-home-business can generate long tail income (money that comes in again and again) from one small effort. Learn how to easily gain the most important things in life; freedom, friendship, financial security, prestige, tax savings, legal protection, fun, adventure, self sufficiency, fulfillment and more satisfaction… with very small amounts of money and time. Secret #1: The business must enjoy the multiple effect. 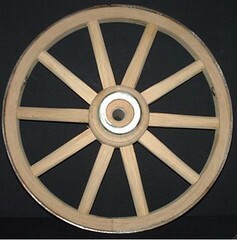 A product once created must produce profits again and again, almost on a never-ending basis. Each venture in the business needs to make a huge return to start and then continue generating earnings year in and year out. Secret #3: The money making system must have a purpose beyond money and be enjoyable and fun! Sad but true, most of us make money for the sake of making money. Many spend their lives working, just to have a few precious hours having fun. The most important fact I learned about making and keeping wealth was that those who were richest absolutely loved what they were doing and felt they were doing something that was good! Money was of secondary importance to their effort. And as things are, this means they actually ended up making more! Secret #4: The money making system must be flexible. No matter what the economy brings, your ability to make money should work regardless of inflation, recession or even depression. The business must have resilience-so if times turn tough, they can evolve and turn change into even more income. Secret #5: The business must be able to start small, but grow large. I learned that business ideas work best with small starts to begin and can be operated on either a full or part time basis. Most businesses start with a learning curve. During that time, it is essential they are small. 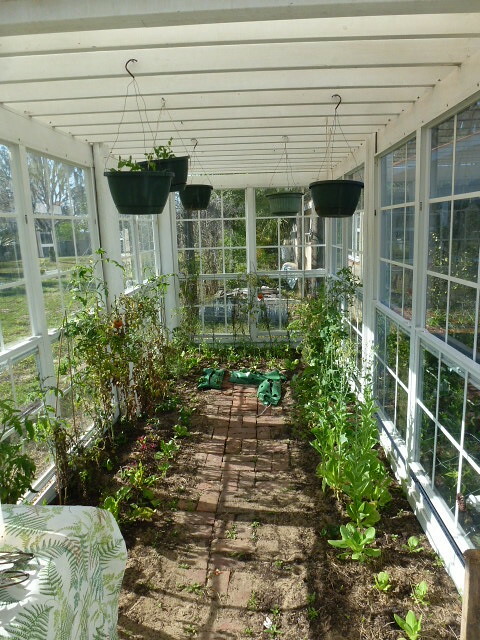 Once the lessons have been learned and the system is operating properly, then it can grow larger with higher income. The way to make money in this way is by publishing to sell! Almost anyone can make more than respectable income when they publish to sell. Publishing to sell fits all five secrets above, even if you never write a thing. We’ll look at the other four secrets in a moment. Publishing is not writing! Publishing is the business that makes money from writing. You may have read or heard about the great wealth good writers can make. Guess what? Writers make that money from a royalty paid to them by a publisher. The royalty is normally 15% of the book’s wholesale sales, after returns. Guess who makes the other 85%? Guess whose decisions make or break the fortunes of the writer? The publisher! Publishing to sell is a business where you get the 85% from publishing, PLUS MORE… and have extra earnings that just keep keep rolling in, year after year. Publishing is the business of producing, selling and delivering words. “Publishing-to-Sell” is the business of producing, selling and delivering books that provide important valuable information, but also leads to the sale of other publications, services or products. For example, Merri and I used publishing to sell in Ecuador. We published a report about living in Ecuador. This was an informative report that helped thousands of readers move there. 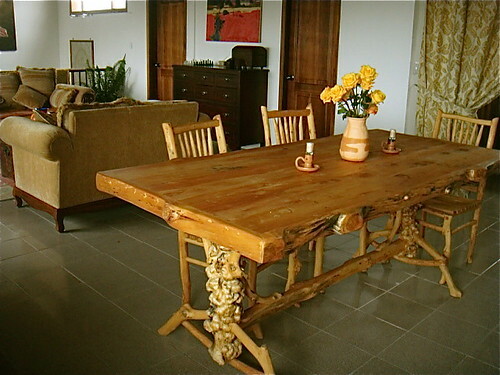 The report also outlined the benefits of our Ecuador real estate tours and Super Thinking Spanish courses. That particular effort starting in 1995 created a million dollar business that still generates earnings to this day even though we have not been in Ecuador for many years. Here are other examples. One publisher who used the course, Joe Culbertson, D.C. is a chiropractor. Eating junk food creates numerous problems including difficulties in the spine so Dr. Joe created a simple use-at-home spinal device to help the spine. 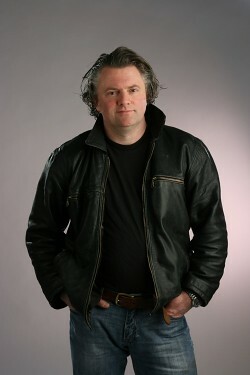 He published a series of articles about the spine. 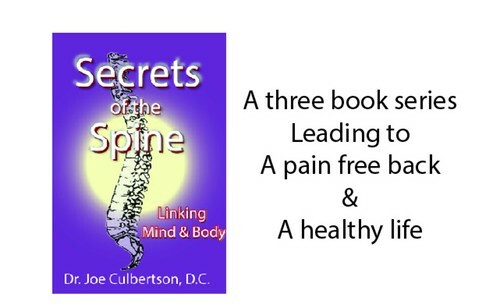 Those articles helped sell a three part book he published Secrets of the Spine: The True Mind/Body Connection. The book helped him sell his spinal device. Another smart self publisher, Jamie Alexander, who used our self publishing course, has a cooking school. Jamie started her professional baking career at age 20 when she apprenticed under the best-selling cookbook author, Nathalie Dupree. When she was living in Paris, she studied at LaVarenne, the Cordon Bleu Cooking School and with the pastry chef of Maxim’s. Her health problems created by high blood sugar levels caused her to have a passion about baking in a healthy way. She began perfecting chocolate cake recipes that added nutritious ingredients and eliminated unhealthy ones such as sugar. You have my word for it, these cakes are delicious and there is not an ounce of sugar or white flour! What a treat! 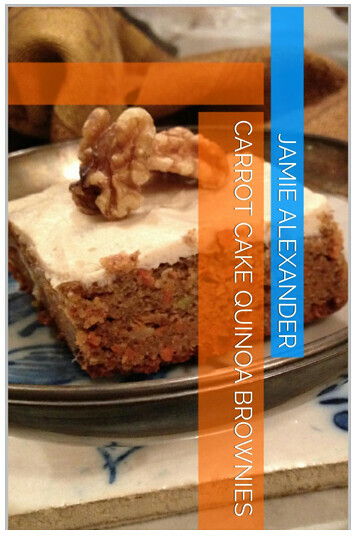 Jamie Alexander’s recipes are for sale at Amazon.com and include “Carrot Cake Quinoa Brownies”, “Reid’s Gluten-Free Chocolate Quinoa Brownies”, “Pumpkin Cranberry Quinoa Cake” and “New Orleans Espresso-Infused Chocolate Quinoa Cake”. See all five Jamie Alexander quinoa stevia recipes below. The sale of these recipes are really valuable and worthwhile, but they also help sell Jamie’s New Orleans cooking classes! You can write what you publish to sell or publish what others write to sell. Some writers, like myself write and also publish. That’s because 85% of the income from printed publications normally goes to the publisher. You can earn as a writer. You can earn as a publisher. You can publish, or write, or both! You can also generate long term income from what your publication sells. 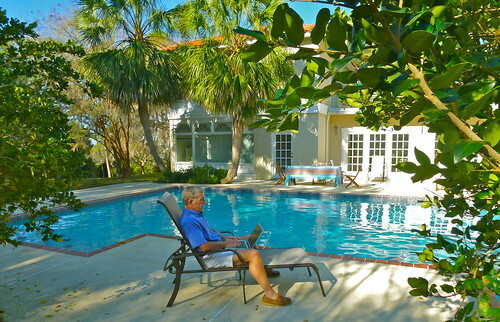 Publishing to sell can create outrageously high long term income for little work and you can do it from your home, in an RV or even while cruising or living on a boat or traveling. It is possible to generate large amounts of extra income month after month, year after year. Publishing to Sell has become better, much… much better. Our early success above (the ten days of effort that still earns 30 years later) began when our publishing-to-sell business was in print. When the Internet became popular and we created a website (in the 1990s), the cost of publishing risk went into a steep dive due to a new advertising medium called Pay Per Click (PPC). Prior to PPC the biggest part of every publishing venture was paper, printing and postage. If a publication was mailed, and not read, the paper, the printing and the postage still had to be paid for. The cost of sending publications which were never opened, created a huge risk. PPC means that a publisher today only pays from the delivery of a publication when it is opened. This dramatically reduces upfront cost and risk. Freedom is the most important benefit. In the 1970s, I had what I thought was a good business but to be honest I could never get ahead. I always seemed to be in debt. The harder I worked, the deeper the hole my finances seemed to be in. My financial situation robbed me of freedom. Then I discovered publishing to sell. Since then our publishing-to-sell business has brought in millions. We gained all the physical possessions we desire, more houses than we could use (we rent them), two tropical beachfront homes and a Tuscan inspired villa in the mountains overlooking a roaring creek, a 250 acre farm and a 900 acre plantation in Ecuador, plus more than enough money in the bank. Our income exceeds our expense. We do not have one penny of debt and we have as much leisure as we choose. We are free to work when we want and can decide when we want to slow down and relax. We live where we like and most important, we arise from bed without an alarm, work without undue stress and have fun every day! My wife, Merri, and I are our own bosses and do what we love. We have learned that through publishing to sell, we can accomplish far more important goals, to gain self fulfillment and be of service to our community. In short, we get paid helping make ourselves and the world a better place. What do you love? Rare cars? You can make a fortune publishing to sell in the genre you love. Do you prefer fine art? Or do you love beautiful jewelry, coins, gems, real estate, furs, model railways, dolls, scientific equipment, war memorabilia, old and rare books, or whatever? Do you prefer social subjects rather than objects? Are you concerned with the environmental problems, with crimes, war, poverty? Would you like to help wipe them out? Each of these offers opportunity in publishing. Are you a golfer? Do you love to travel? Why not make the kinds of money I’ve just mentioned publishing reports about golf courses all over the world? Would you like to help the world be a more spiritual place, help people get along better together? You can do something good for the world, increase your income in the process and live wherever you please! You can make a fortune by publishing information that sells products and services that are interesting to you. Publishing to sell can also be international so you can live anywhere and still earn everywhere. This is especially valuable if you love to travel. For example, one shrewd publisher realized that Panama was a great place to live so published information on Panama that sold Panama real estate seminars. Other publishers reaped rich rewards selling information on their own country. For example, there is currently a huge growth in domestic tourism. Self publishers are in a position to do something about it… by selling U.S. knowledge everywhere! 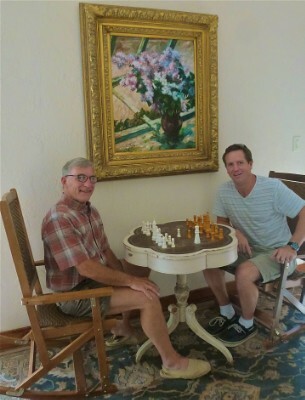 Merri and I, for example, lived in Europe for years, then fell in love with Ecuador for 15 years. We earned by publishing our experiences gained in each place. Now in our 70s, we live in Smalltown USA. 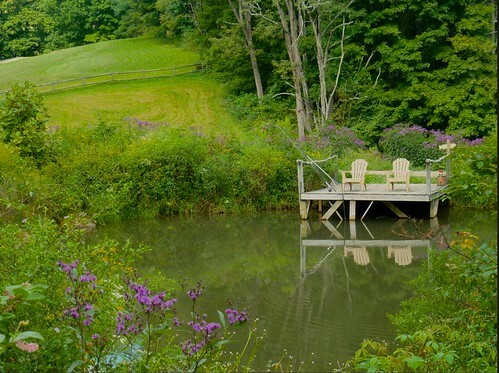 We love the peace and quiet, are closer to my mom, our children and grandchildren. We still publish to sell! In each phase of our lives, the publish-to-sell business allowed us to move and live where we desired. Imagine what this type of business means if you love to travel. Part of every trip you take can be tax deductible! You can honestly write off every trip that is related to your publishing business. Every journey can become a research oriented adventure and a tax deductible event. 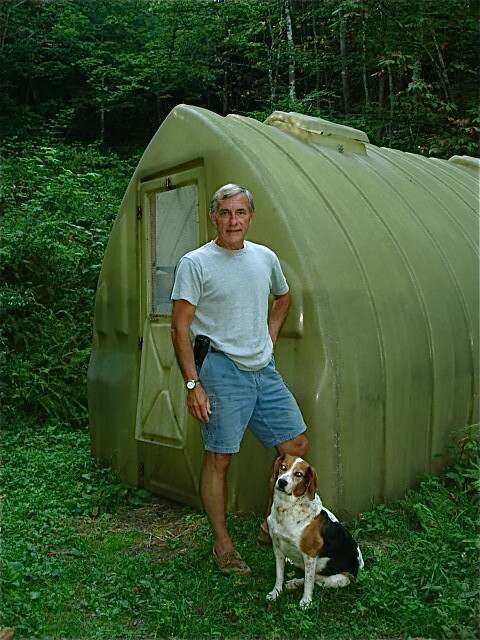 For example, you’ll see how when we reached retirement age, we slowed down our self publishing business but still earned $2,404725.98, tax free, over the next ten years. Many benefits come in the form of reduced tax. As a publisher, you’ll have one of the most respected and tax protected businesses in the country. Other benefits come in the form of legal protection. Publishers are protected by the U.S. constitution. You do not need a license to publish. There is no government watchdog nor do you have bureaucratic red tape involved in publishing. The biggest benefits are the freedom, the independence to work wherever you choose in any field you desire. The 2018 tax law means that you can create a publishing-to-sell business where you only pay tax on 80% of your income. We created an entire system to help our readers have their own publish to sell business. This system is unique because my wife, Merri, and I are unique. We started our publishing business together. Since we’re almost recluses, we decided to do the whole business by ourselves. We began working at home. Today, though we have tens of thousands of readers and have made millions, we still work at home and do not employ a single person. When we switched to online publishing to sell, we added one business partner, our webmaster, who created and runs our website. You’ll can learn how to do this in the course I am about to introduce. May I introduce you to our course, “SELF-FULFILLED – How to Be a Publisher to Sell”. The course teaches all you need to know on how to start and run your own publishing-to-sell business by yourself. The first lessons in the course answers your questions and get you started! Secret #6: How to gain 1,000% returns. See why some of the wealthiest families in the world today come from publishing. Learn how margins can be so incredible that few would believe them. This online course contains many case studies. Case Study #3 for example shows one publisher who sold an idea delivered on one photocopied page. His cost was only three cents, his selling price $12.50! Secret #7: How to create and market your product or find products to sell. Learn 11 steps in creating the perfect product. Understand how to review ideas, test focus, aim at markets. See why you don’t have to write anything if you don’t want to! Learn where and how to get your data and get others to write for you almost FREE. For example, the course shows how one friend, before the Internet, never wanted to write and decided instead to publish on cassette tape. He later switched to webinars. He started part time and built a career that brought in millions and brought him to know some of the most interesting people. Now of course publishers who do not want to write can use the internet. Learn how marketing is the key to successful publishing and how to turn pennies into dollars with good marketing focus. Gain samples of winning marketing pieces. Learn 21 frequently committed marketing blunders and what to do about each. You’ll learn how to turn advertising dollars into a fortune. How to create your own ads. When to use classifieds, space ads, direct mail or word of mouth. See how to build a PR list and get thousands of dollars in free publicity. I share my most secret results on recent mailings so you will know why sometimes you sell more units of a publication at $49 instead of $29. I show how one couple used ads about retirement to supplement their retirement income and get free trips all over the world. Secret #8: When to print, how to print and when to go online only. How to print and fulfill. Learn how to cut your printing bill in half by asking for quotes differently. Learn tricks of the trade, how to get the best quality at the lowest price, why to avoid the biggest printer in town and why to avoid the franchise printers. Secret #9: How to compute and use the Internet. With an inexpensive computer, you can easily run a business from home and still have tons of time left over-even if you are computer illiterate. Merri and I have proven this! The secrets in the course include a step-by-step approach on what to do. Our partner, the internet expert includes what you need to know for online publishing. The course contains information on how to use computers and the Internet for your publishing business. For example you will learn how I have eliminated hundreds of thousands of dollars of printing and postage by switching all of my business onto the net. We unlock all the secrets of publishing so you can have increased lasting income and reduced taxation. This course is perfect for those with great computer skills and can help you learn how to focus these skills into a profitable publishing business. However, the course also helps computer illiterates like myself and shows how to get your computer work done with no upfront cost. I have created this course in an easy to understand style. Everything is explained what to do in vivid detail. We share all, how we have done it ourselves. The course is full of publishing ideas and case studies. You’ll learn about a pilot who published a book on the best airport cafes. All his flying became tax deductible! You’ll see how one couple who loved an island wrote a guide on the place and made enough to buy a home on the beach there. Another made millions with one simple legal idea. I give names, resources and addresses of contacts in marketing, printing, plus attorneys, accountants, Internet whiz kids who can give help. This course is not theoretical. It describes on a step-by-step basis, how Merri and I built a million dollar international business in just 7 years and how you can do the same. The course is designed so you can get your own publishing-to-sell business going, full or part time right away. I’ll explain how and why by sharing one other amazing experience that makes this special offer available for you now so you can have the course for pennies on the dollar. I have previously exposed this idea only to my readers and never to the general public. We conducted a course charging $2,000. Here are raves from delegates who have used our course. Merri and I have been overwhelmed by how much the course helped so we conducted another course and recorded it. We then reproduced it in written form so it can be delivered entirely online at a huge reduction. Though many readers have paid up to $2,000 for this course, you can start for only $299. Lesson #1: A Day in the Life of a Publisher. See how you can start with only a very small amount of money, work as little as four hours a day (if you are operating full time) even less if you start part time. 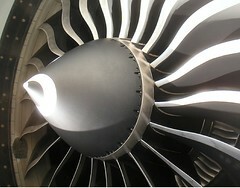 Learn how two of my publishing friends, one an M.D.-the other a pilot ran their own money letters. This gave them incredible tax protection, took them on many free, exotic trips, widened their perspective and field of friendships, helped them keep the money they were making in their fields and gave them a backup business that they loved for retirement. Lesson #2: How to Create Your Product. Learn 11 steps in creating the perfect product. Understand how to review ideas, test focus, aim at markets. See why you don’t have to write anything if you don’t want to! Learn where and how to get your data and get others to write for you almost FREE. Lesson #3: How to Choose Your Format. Some ideas are timeless and can be sold in a book for years on end. Others are better in a magazine, newsletter or other periodic publication. Some products can just be lists, simple one page photocopied ideas or names and addresses. Understand when to print, record (on audio or video) and when to transfer through the Internet. Learn how to choose the format that suits you, full or part time. Lesson #4: How to Publish to Sell. Learn how marketing is the key to successful publishing and how to turn pennies into dollars with good marketing focus. Gain samples of winning marketing pieces. Learn 21 frequently committed marketing mistakes and what to do about each. Know where and when to advertise (such as never near Easter-Christmas is OK). You’ll learn how to turn a few advertising dollars into a fortune. How to write or have ads written. When to use classifieds, space ads, direct mail or word of mouth. See how to build a PR list and get thousands of Dollars in free publicity. Learn the tricks of the Internet to easily focus and capture a market there. Lesson #5: If You Print-How to Print? Did you know that you can reduce your printing bill by half just asking for a job in the right way? Learn all the tricks of the trade, how to get the best quality at the lowest price, why to avoid the biggest printer in town and why to avoid the franchise printers. Learn how to choose the right graphics, correct paper, envelope, style, letter fonts. When on demand printing is best. Every Secret is included. Lesson #6: How to Fulfill. This session is a practical guide on how to administer your business. How to set up a computerized fulfilment system, get local families to do all your work for you and run your business (if you wish) from your home. Learn how and why to use low and variable overheads, yet give one day turn-around delivery. Learn when to choose delivery services, to fulfill yourself or build your own system…or when to simply fulfill via the Internet. Lesson #7: How to Finance. Learn all you’ll need about the financial end, of the business, how to control physical or online inventory, keep overheads down, check ad results, get 30 day free credit and stay on top of your business. Learn 11 hazards to avoid and tricks to stay profitable without a daily accountant. The course and manual contain all these secrets and more. The computer/internet workshop personalizes the knowledge so you can get started. This course is for those who would like their own publishing business for fun and profit but also helps business people, brokers and professionals, insurance agents and marketers who want to enhance their existing business or build a second source of income. Publishing can be used to shift the cost of marketing into a profit center. If you want your own full or part time publishing business, or want to build your existing business through publishing you should sign up for this course right now with a special pennies on the dollar offer. This course is for individuals and couples. You can order the course but your entire immediate family has permission to use it. We include those who want their own business or who want to have a business together or a family business. Business people or professionals who want to add an extra profit center to their business or who want to change their business entirely will benefit. Those who want more control over their career should take this course. Plus those who love travel and want to turn their trips into profitable tax deductions! Only those who really want to publish for profit or to expand their business should sign up for this course. We have created a proposition where you cannot lose, but the course is not for idle curiosity. We are giving away every business secret we possess and expect those who use it to reap fortunes in extra income, tax savings or expanded business. We expect this knowledge will change your life for the better. You’ll gain extra income, more fun, adventure, friends, freedom, independence and prestige too. Due to the enormous savings of an online course, you can start for only $299 with a full money back if not satisfied guarantee. Merri and I have had a publish to sell business together for over 30 years and both of us were in publishing before we got together. Merri’s publishing experience even outstrips mine and we spend a great deal of personal time continually updating the course as the publishing business evolves. We have a successful publishing business with over 20,000 readers, so our updates are based on real time experience. Are you interested in a publishing business? It can be small and part time mainly to gain prestige, fun and tax benefits. 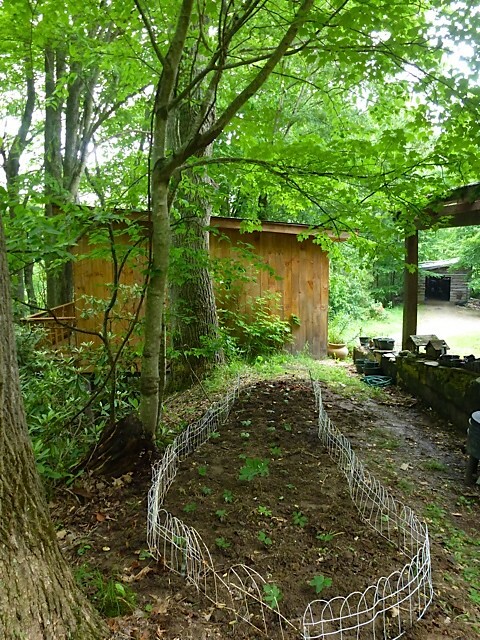 It can be full fledged and rake in thousands a day. If so, this course is an absolute bargain. You should sign up now! Our goal and guarantee is that you will be able to run your own publishing business that publishes to sell. Though many readers have paid up to $2,000 for this course, you can start for only $299. You could not duplicate the computer and Internet knowledge for $2,000. It covers what you need to get on the Net, how to use the Web to publish, how to define your Internet market, how to develop your site, target your market and start getting visits, the top ten Internet tips to use, the top ten traps to avoid, and many other lessons our Webmaster has used in his 20+ years on the net. In many cases your tax savings will be five to ten times the cost of the system alone, plus you will learn how to gain thousands of FREEBEES and earn hundreds of thousands a year. Our publish to sell business has brought us more wealth, satisfaction, fun and friendship than I imagined possible. It has brought so much to my life, I would like to help everyone be in publishing and I hope you are one with whom I will have the pleasure sharing this exciting and profitable way of life! Whether you are retired, an investor, chiropractor, doctor, dentist, professional or already own your own business, this offers another way to make money, to turn your passion into profit. We guarantee to share all we know to help you start and run your own publishing business. Don’t miss this opportunity. Sign up with this special offer. If you are not fully satisfied, you can cancel the course any time in the first two months. What all professional publishers know is that the world of publishing changes continually and that the key to continual success is to test, test, test and keep the business evolving with the market place. The course you receive is up to date, but it will fall out of date soon. To keep you in touch with the latest trends, techniques and ideas, we add regular update lessons to your course. We have over thirty years experience and are active in the publishing world every day. We work with several of the largest internet publishers in the world and gain a continual flow of new experiences, ideas, tactics and strategies. Your update lessons bring you the latest innovations that are being used in the publishing world right now. This is a key to maintaining a continual flow of everlasting residual income from you publications. We unlock all the secrets of publishing so you can have increased lasting income and reduced taxation. This course is perfect for those with great computer skills and can help you learn how to focus these skills into a profitable publishing business. We are so confident that you’ll gain from this offer that if you are not fully satisfied, simply email us any time during the first 60 days for a full refund. Pinnacle careers can help us neutralize depressing events. Many readers tell me they are depressed with the state of their nation. This is not just an American comment. I received messages from readers in Canada, Ecuador and all over Europe… plus a few from Asia… especially Japan and Singapore. A common source of this depression is their view of the change that has taken place in the democratic process. Here is how to make such a view better. Merri and I lived and worked with a number of Andean shamans and one specialized in treating children who had depression. His prescription was “eat well – sleep well and work hard with joy in the heart”. He had them live in this routine and soon they were back to youthful brightness. Perhaps the most important lesson we learned from the years with this yatchak was learning how to make work joyful. 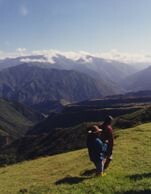 Shamans walking with views at our Andean hacienda. 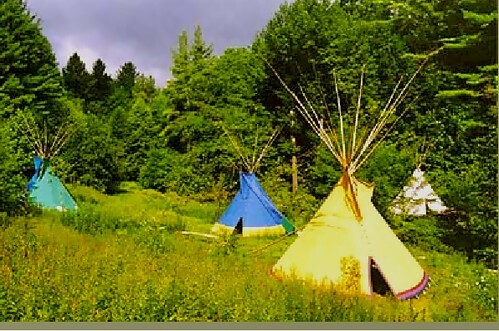 One reader who moved to Ecuador for example wrote: Many of us who served in the Viet Nam war are now in our sixties and can no longer afford to live in the country we served. I was fortunate to have served in Vietnam, Beirut and Iraq. I love what my country was, but have my doubts about America’s future. This depressing view has been developing for a long time. This is a natural evolution. My first book “Passport to International Profit” published in the 1970s, explained why this change would come when it defined the “Concept Conversion Trick” and said: “The Concept Conversion Trick begins when people agree on a good concept for working and living together. The people go to work and if the concept is good they will create a paradise. The government gives them a flag and a song. Then the government pulls the trick. The government convinces the people that the flag and song are important. Then while the people are busy watching the flag and singing the song, the government replaces the concept with a set of ever increasing written rules and regulations administered by bureaucrats and backed up by a police force. If this writing sounds prophetic having been written 30 + years ago, it was not. A simple review of any previous great society shows this trick and the evolution brought by it. Like the Roman Empire, things may get better for a while, then worse and then better again. In the long term, as societies age, they lose their original vibrancy and life. This is the universal nature… to grow until the growth becomes so excessive that balance is lost. Read more from my 1970s book “Passport to International Profit” “Don’t be a sitting duck when the shooting starts“. Having decades of experience offers many benefits… inner growth, more focus on health and the ability to coax our community into a better place. These separate subjects, actually tie together rather well in a pinnacle career. Health, wealth, meaning and service are so inexorably linked that if you apply the process of having one it becomes easy to have the others. This thinking came clear to me years ago when one small sentence in a book review about “The Wealthy 100” which showed the fallacy of working just for cash. 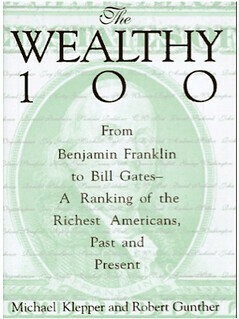 This book showed who the wealthiest people in the world were by looking at their wealth at the time of their death in relation to the GDP of the U.S.
John Jacob Astor was the wealthiest man in these terms as his wealth equaled 1/65th of the U.S. GDP. The paragraph in that article that shook me to my roots was: “The stories of the Astors, Vanderbilts and Morgans have been fascinating. They were not always the smartest, or best educated, but possessed a single minded discipline. If there was a common denominator it was a passion they brought to business whether inspired by greed or desire to be the best. My immediate thought was, “How would I feel if in the last 30 seconds of my life I realized that I was the richest man in the world, ever and yet I had lived an unhappy life? This is why pinnacle careers offer more power than any we have had in the past. If we have a career doing what we love, we do better and joyfully, put in more energy, time and care. This is nature’s irony; if we chase money, it seems to run away. If we pursue our passion and work without concern for the cash, the wealth can’t resist us. Now is a great time to know more about health and its relation to wealth because as the economic slowdown carries on, people feel worse. They look for new values and ways to feel better despite the negatives in the outside world. We live in a holographic, fractal universe. This quantum reality can be summed in the phrase, “As above, so below”. Most humans on this earth are feeling the external turmoil within. We are all one and we are all connected. All the negativity that abounds in uncertain economic times impacts us all at some level. There is no better way to overcome this, to make a positive statement in the way we serve others. Charity is not the main answer either. For success, we must be rewarded for our efforts. 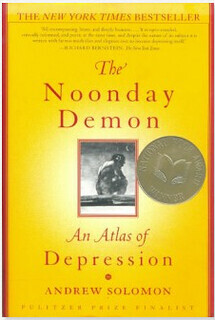 “The Noonday Demon: An Atlas of Depression” is a book on human behavior by Andrew Solomon. This book tells of a unique study that shows how people put meaning back in their lives after the most horrible of circumstances. The book reviews a study of Cambodian women who had survived the trauma of Pol Pot’s Khmer Rouge purge where 20 % of the population was destroyed. The three-step plan used gives us a great insight into how we can have true wealth. First, the women were taught to forget, the psychotherapist Phaly Nuon, a woman who had lost her family as well says they used exercises each day to forget so that each day they could forget a little more of the things they would never entirely forget. They distracted with music or embroidery or weaving or whatever seemed to work. “The loss is under the skin”, she said “and we cannot take it out.” But they could forget that it was there, even though it was. Second, Phaly Nuon taught them to work. They had to learn to work well, have pride in the work and to be paid. The receiving of energy as well as the giving of it was necessary to make this work. Finally, once they had mastered a trade or profession she taught them to love. She used a steam bath to do this, where the women could meet and give one another manicures and pedicures. Doing this made the women feel beautiful and put them in contact with the bodies of other people and to give up their bodies to the care of others. Grooming is one of the primary forms of socialization among primates and this return to grooming brings the women back to balance. Finally, she taught the women one more vital lesson, that these three steps, forgetting, working and loving are not three separate skills, but part of one enormous whole. The practice of these three things together each as part of the other is what makes the difference. Wholeness in giving and receiving is the answer. If we give too much without allowing others to return we manifest the parasitic element that lies within us all. This is good advice for viewing the changes that have taken place in our world. Understand what has happened… accept the change… and rise above it to make the existing reality more positive for all. There is no more powerful process than serving through business. Give. Give in ways that support this earth and help the world. Serve in a way that brings joy to your heart. Your rewards will be better health and wealth. There is no other model for success that makes more sense. Learn how to serve by writing to sell. We have added a new service and have many, many new readers so let me outline why we share ideas about health and wealth plus an introduction on a free new service. See below up to the minute ways to prosper. A reader sent this note: Good morning Gary, I always enjoy reading your emails. You are as eclectic as any thinker I hear from. This beautiful note took me by surprise because eclectic is defined as “Deriving ideas, style, or taste from a broad and diverse range of sources”. just one source… the hub. The spoke of living… for purpose, health and wealth… viewed in our messages may vary… but only as threads that are strung to the same spot. Though the subjects in our websites seem to range from natural health… to global, funky micro businesses… to multi currency investing…to super thinking through frequency modulation… to self publishing and Ecuador… to shamanic balance… they are all about one thing… how life is frequency… how frequency is change… how to embrace and how to prosper from change. the pace is picking up. The dots are moving faster but they are the same dots moved by the same force that has always moved the world. This site is about connecting those dots to help you prosper from change by sharing our experiences of over 40 years of global investing, business and living. Being global is not the panacea however. The expanded horizons are what help us see further into the future and grow. Life is a trip and we have an entire globe to enjoy the ride. Expanding our horizons beyond our local borders can help our visions penetrate the mists of tomorrow so we can adjust to gain opportunity and avoid any danger ahead. Then in April and May 2010 the week before the Dow dipped again below 10,000 in the worst one day crash ever: I shared three warnings about the US stock market at Jyske Global Asset Management’s (JGAM) Laguna Beach forex seminar, a weekend ago and began slipping these warnings out in messages even before then. Our April 21 message warned about the risks in May 2010 that start with Seasonality. Then May 3, 2010 our message had an Economic Cycle Review that showed why equities could be dangerous then. This was just before the storm. This chart from www.finance.yahoo.com shows how our warnings were just before the worst one day drop in the Dow’s history. Before I could get the third warning to readers, the bottom fell out of the Dow as this Dow Industrial chart from finance.yahoo.com shows. This third warning could have been helpful to readers but a daily message was not fast enough. Now we need to help expand the horizons faster. Since 2007 volatility and our need to reach readers quickly have grown and I am taking the British Prime Minister’s recent fight with Europe over the euro crisis and sovereign rights as a signal. A 100 year review of the Dow Jones Index shows that the global economy has moved in 17 to 20 year bull and bear cycles with each bear leading to a major struggle between England and Europe. Post war booms fueled each bull. A study of those cycles suggest its time for another Anglo Euro conflict. The current bear began around 2000 so expect another two to four years of economic turmoil before a recovery. The current bear creates enormous long term share value but with great short term market and currency volatility. This calls for multi currency diversification. An easy way to diversify is with major companies that have the size and strength to gain momentum in these bad times. They’ll accelerate their profits when the economic turn good. Look for value in the world’s larger companies like Wal-Mart… Royal Dutch Shell… Toyota… State Grid… AXA…China National Petroleum… Siemans… IBM… American Express… Coca Cola. Each earns globally so also adds multi currency diversification…although some of them are not on my plate because of what they stand for…not what they will earn. Mutual funds that diversify in many companies globally is an alternative. An example is First Eagle Overseas Fund (Symbol-SGOVX). At the end of 2011, the fund had assets over $10 billion invested in nearly 200 different holdings. This fund has been down for several years and offers a bumpy ride. Yet it has finished in its sector’s top five percent numerous times. It has been rising 3.94 percent over the past five years and 13.08 percent over the past decade. England may or may not decide to get along better with Europe but the crisis and global volatility will not end soon. Realize this turmoil is natural and diversify for safety. More on this in an upcoming message. To make sure we can reach you quickly with changes created by the turmoil we have expanded beyond a daily email service… a new service in the circle… Tweets. We hope that sharing our current experiences against the backdrop of our past will help you prosper from change. Join us in January. Balance health with frequency and learn Spanish in four days! Become a part of our business. Learn how to earn teaching Super Thinking.